Ross has been licensed since 1964, and currently holds an Amateur Extra Class license. Ross has traveled and operated extensively throughout the South Pacific. Previous calls include: FO0FB, KH6GJW, 3D2FB, ZK1XE, ZL0AKO, VK3BZZ, KL7FFT, XE0GFJ, and WB6GFJ. Ross is a member of NCDXF, NCDXC, NCCC, RSGB, CDXC, and ARRL. Ross is currently an advisor to the Northern California DX Foundation, is a past president of the Northern California DX Club, was a Vice-Director of the ARRL Pacific Division (1981), and is a former manager of the Incoming W6 QSL Bureau. His current DX totals are 357/339 mixed overall and he is on the DXCC Honor Roll and CQ Magazine DX Honor Roll. 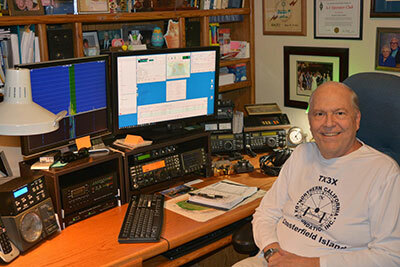 Ross operates SSB, RTTY and CW. Currently retired, Ross has been an IT Manager for Sevin Rosen Funds, held various IT positions for a large Palo Alto law firm, and ran his own import/export company in the 80s. Early in his career he held various positions in commercial broadcasting.